The first wind farm foundation component for the project was installed in July 2015. GE supplied five of its Haliade 150-6MW wind turbines for the offshore wind farm. Officials during the launch of the Block Island wind farm. Tetra Tech provided environmental compliance monitoring during the turbine foundations and components installation. Image: courtesy of Deepwater Wind, LLC. Fred. 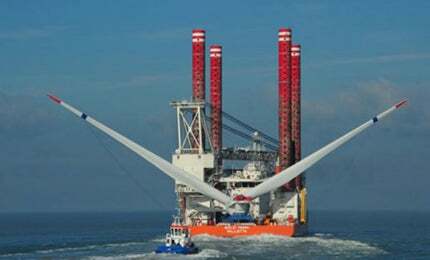 Olsen Windcarrier's Bold Tern self-propelled jack-up vessel installed the turbines in mid-2016. Image: courtesy of Fred. Olsen Windcarrier. Block Island Wind Farm is a 30MW offshore facility developed by Deepwater Wind, three miles (4.8km) south-east of Block Island, Rhode Island. It is the first commercial offshore windfarm in the US and became fully operational in December 2016. The project’s final federal approval was granted in September 2014. It achieved financial closure in March 2015 and another major milestone was achieved in July 2015, with installation of the first of five 400t steel foundation jackets for the turbines. Submarine cable installation works began in the first half of 2016, and wind turbine installation started in mid-2016. The wind farm is being developed by EverPower Wind Holdings, a subsidiary of EverPower Renewables Corporation. The pioneering US offshore windfarm generated approximately 300 construction jobs. The windpower facility generates approximately 125GWh of clean energy a year, which is enough to serve approximately 17,000 households, and further reduces electric costs by 40% on Block Island. The project will also offset 800,000t of carbon dioxide emissions over its estimated operational life of more than 20 years, which is equivalent to taking 150,000 cars off the road. The offshore windfarm is equipped with five GE Haliade 150-6MW offshore wind turbines. The three-bladed turbine was commercially deployed for the first time offshore. It has a 150m diameter rotor, which provides a 15% better energy yield compared to existing offshore turbines. The turbine is equipped with a direct-drive permanent magnet generator and three identical full-power converters operating at 900V each. The turbine parts including the inverter, transformer, switchgear and low-voltage electrical distribution cabinet are located at the tower base. The use of the generator eliminates the need for a gearbox. The turbine integrates GE’s Pure Torque design, a rotor support concept that protects the generator from deflection loads by diverting unwanted mechanical stress towards the tower. It separates the turbine rotor and generator to ensure that only the torque or turning force is transferred to the generator. Each turbine foundation weighs approximately 1,500t, featuring steel jackets, decks and piles. The project connects Block Island to the national power grid for the first time. A 34.5kV submarine cable interconnecting the wind farm’s inter-array cable and a 34.5kV transmission cable conveys the power output to an interconnection point on Block Island. A 21.8-mile (35.1km) long bidirectional Block Island transmission system (BITS) comprising a 34.5kV alternating current (AC) submarine cable then conveys the output to the landfall in Narragansett, Rhode Island. The project also entails the construction of a new substation integrating two switchyards at the site of an existing power generation facility owned by the Block Island Power Company (BIPCO), in the Town of New Shoreham on Block Island, which serves as an interconnection point for both the windfarm and the BITS. The BIPCO substation was also upgraded to complement the new substation. The operations and maintenance facility is located in the Point Judith area of Narragansett. The operatorship of the BITS was transferred to The Narragansett Electric Company (TNEC), upon completion of the construction activities. The project received $290m in financing provided by the mandated lead arrangers consistin of Société Générale and KeyBank National Association. In addition, $70m in equity funding was provided by Deepwater Wind’s existing owners, an entity of the D.E. Shaw Group. Latham & Watkins acted as the borrower’s counsel, Hinckley Allen of Providence served as the local counsel and Van Ness Feldman served as regulatory counsel to the developer, Chadbourne & Parke served as the lenders’ counsel and Locke Lord Edwards of Providence served as the lenders’ local counsel. Green Giraffe was the financial adviser for commercial arrangements to the developer, while Mott MacDonald was the lenders’ technical advisor. Turbine supplier GE is also responsible for providing operations and maintenance support for the windfarm for 15 years. The steel jacket foundations were fabricated by Gulf Island Fabrication, whereas the fabrication work on components of the foundation substructures was performed by Specialty Diving Services (SDS). The joint venture of Weeks Marine and Manson Construction is the offshore foundation installation contractor for the project. The onshore and underwater sound impact assessment was performed by Tech Environmental, with the environmental compliance monitoring during installation was rendered by Tetra Tech, and the marine warranty surveying services were provided by LOC Houston. Fred Olsen Windcarrier has been contracted to supply its self-propelled jack-up vessel Bold Tern to perform the turbine installation works, while Rhode Island Fast Ferry has been awarded the 20-year deepwater wind crew transfer contract for the windfarm. ABS Group is the certified verification agent (CVA) for the project. American Polywater® Corporation is a leading manufacturer of cable pulling lubricants, cleaners, sealants and MRO and construction chemicals used in the installation, maintenance and protection of power infrastructure assets.